Perhaps you have a story from your high school sports days that you keep telling over and over again. Well, your story doesn’t come close to the one that Marvey’o Otey now has in his back pocket. 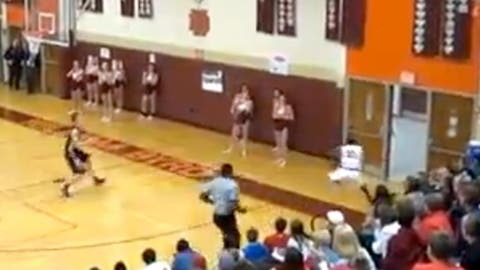 Otey, who plays hoops for William Byrd High School in Virginia, pulled off the shot of a lifetime in a recent game … and he didn’t even get to see it go in. After chasing down an errant pass, Otey flung the ball behind his back toward the hoop. His momentum then carried out of the gym and into a hallway. Let’s just stop talking about it and show it to you. You’ll want to watch this a few times.